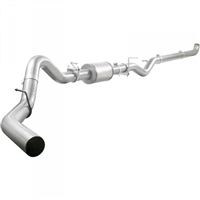 The AFE 49-44017 Mach Force XP 4" Down-Pipe Back Race Exhaust System for your 2007.5-2010 GM 6.6L Duramax is engineered to perform in the most extreme environments. This system is constructed from mandrel bent 4" stainless steel tubing for maximum flow, increased horsepower, increased torque and lower EGTs. 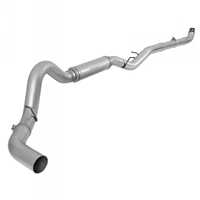 The AFE 49-04033NM ATLAS 5" Downpipe-Back No Muffler Race Exhaust System for your 2007.5-2010 GM 6.6L Duramax is engineered to perform in the most extreme environments. 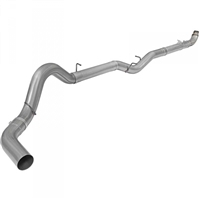 This system is constructed from mandrel bent 5" aluminized steel tubing for maximum flow, increased horsepower, increased torque and lower EGTs. 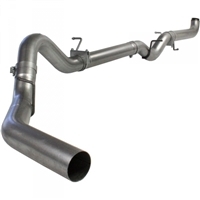 The LARGE Bore HD exhaust is engineered to perform in the most extreme environments. This system is constructed from mandrel bent 4" stainless steel tubing for maximum flow, increased horsepower, increased torque and lower EGTs. 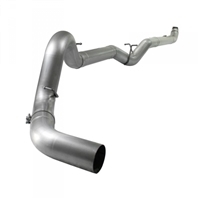 The AFE 49-04002 ATLAS 4" Downpipe-Back Race Exhaust System for your 2007.5-2010 GM 6.6L Duramax is engineered to perform in the most extreme environments. 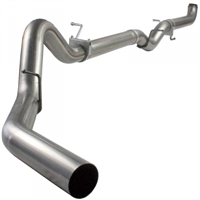 The AFE 49-04059 ATLAS 4" Downpipe-Back Exhaust System for your 2001-2010 GM 6.6L Duramax features a 4" mandrel-bent aluminized steel construction for maximum flow, increased horsepower, torque and lower EGT's.